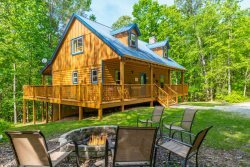 BRAND NEW For Blue Creek Cabins "Above and Beyond" This cabin really lives up to its Name & will be sure to give you an UNFORGETTABLE experience! The view alone is SPECTACULAR & worth the time. You will enjoy at top of the HEAVENLY get-away, Plus a paved road all the way to the front door!!!! You will not want to leave once you get there. Enjoy Private Decks with Breathtaking Views. The Detailed and Rich design of the cabin is sure to Arouse your Senses. A large hot tub with a great VIEW of the mountains is waiting for You to Enjoy. Find Peace and Relaxation while taking in the Mountain View from Any of the three Levels of the Cabin. Yonah Mountain Vineyards is less than 2 miles away and you can get to trails and sightseeing in less than 10 minutes from the cabin. You are sure to enjoy your stay "Above and Beyond" your expectations. Minimum Age of primary renter: 29 Years Old. The road to this cabin is paved. The max number of vehicles in the driveway is 3. Sleeps: Up-to 8: Do not exceed 8 guests! The cabin and view were beautiful!! I will go back again!! I loved having the key code so we didn't have to go by your office. It made it easy for us. Alex was knowledgeable and helpful in meeting my needs and expectations. The process was easy and simple to book. The property was as good as it was advertised, even better. Everything we needed was provided and in working order. It was very comfortable and cozy. It allowed us to really sit back and enjoy our time in the mountains. The view is amazing and the amenities are great.